In this workshop you will learn the fundamentals of solar electricity and the current incentives that are offered through the California Solar Initiative (CSI) program. We will explain how to calculate your energy use and properly size a solar system for your home, as well as how to find and research solar contractors. The more you know, the better prepared you will be when choosing a contractor that is right for you! Please note that this event is for homeowners. 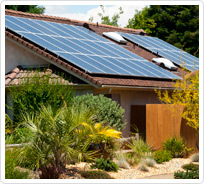 If you are a solar contractor, please attend the workshops offered for contractors. If you are unable to attend on this date, click here to register for other CSI workshops.